If you’ve been reading my reviews over the last several months, you may have noticed I’ve been on an Adobe Photoshop Elements 10 (PSE10) kick. Today I present the finale of these reviews: three books that can help you learn and enjoy using PSE10. It’s truly amazing what you can do with PSE10 and a little knowledge! Photoshop Elements 10 All-In-One for Dummies can be considered the bible and “go-to” book for all things PSE10. Calling this book comprehensive is an understatement! Authors Barbara Obermeier and Ted Padova mention in the introduction that they asked the publisher for more space in the book so they could add even more information to an already jam-packed tome. I can’t imagine what more could be added! Like most books of this genre, it’s not necessary to read it in order, though it’s a good idea to start with Chapter One and move on from there. It would also be helpful to read this book in close proximity to your computer so you can follow along. This way it’s much easier to understand the concepts presented. 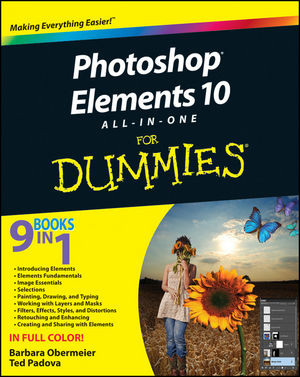 Photoshop Elements 10 All-In-One for Dummies is broken down into nine sections. The Table of Contents can be found here. If you can’t find what you’re looking for in the Table of Contents, then search the 30 page index. As I said, this is a very comprehensive book. Adobe Photoshop Elements 10 is part photo editor, part photo organizer. Just learning how to use the Organizer alone can be overwhelming, especially if you’re a newbie like me. Obermeier and Padova use most of Book II explaining how the Organizer works, getting photos into the Organizer, and categorizing them with albums and keywords. One thing I like about Photoshop Elements 10 All-In-One for Dummies is that while it simplifies sometimes complex concepts, it never talks down to the reader. Photoshop Elements 10 All-In-One for Dummies uses plenty of photos and graphics next to the text, making directions easier to understand. Loads of tips are scattered throughout the margins, represented by a target with an arrow through the bullseye. Sometimes, what seems like a minor tip to one person can be a godsend to another. For new users of PSE10, Photoshop Elements 10 All-In-One for Dummies will be a bible. For more experienced users it’s a great refresher course. Some people learn better with fewer words and more pictures. 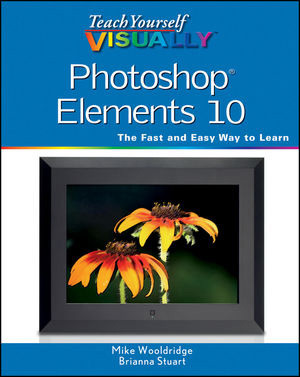 For those people, Teach Yourself Visually Photoshop Elements 10 (TYV) is the perfect book. Each technique is described in a few sentences, then shown in a step-by-step sequence, complete with labeled photos. There’s no fluff or extra words; most techniques are shown in one or two pages. It’s easy to find what you want, follow the directions, and move on. Like Photoshop Elements 10 All-In-One for Dummies, Teach Yourself Visually Photoshop Elements 10 has an online Table of Contents. The top part of each page in TYV is color coded by chapter, making it a bit quicker to find what you’re looking for. Experienced PSE10 users may find Teach Yourself Visually Photoshop Elements 10 a little too simplistic as a reference guide. But for newbies to intermediate users, Teach Yourself Visually Photoshop Elements 10 will be the book you’ll refer to again and again. 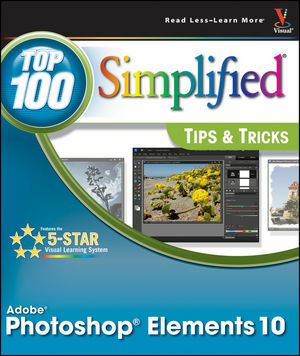 Adobe Photoshop Elements 10 Top 100 Simplified Tips & Tricks assumes you already have the basics down of PSE10. This book isn’t a how-to book; rather, it’s a collection of tips and tricks to help make using PSE10 faster and easier. The layout is similar to Teach Yourself Visually Photoshop Elements 10: a few sentences describe the technique, then it’s explained step-by-step with text and photos. Each tip is rated with a difficulty level and colored symbols representing skills needed. A listing of tips and tricks can be found here. Tips are categorized into chapters for easy searching. Most techniques are covered in two pages, and all have three extra tips with additional information, shortcuts, or warnings.